We card our own handdyed fibers. The batts are perfect for handspinnig, felting and other fiber art. We spin all our yarns by hand. In corporation with knitwear designers you will find our yarns in combination with a pattern in a knitting kit. fabrics for accessoires, patterns for greeting cards and home textiles. 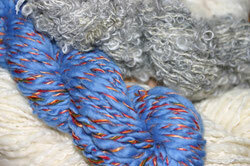 The materials we use are ICord, linnen, wohl and other exclusive yarns.